Kenji Ekuan, graduated from Tokyo’s National University of Fine Arts and Music in 1955. Studying under the highly influential teacher Iwataro Koike, here Ekuan met future design partners Shinji Iwasaki, Kenichi Shibata, and Haratsugu Ito, with whom he would later form the ‘Group Koike’, the core of GK Design. GK Industrial Design Associates, the precursor to GK Design, was founded in 1957 with Ekuan its chairman. Ekuan played an important role in the company’s success through his ability to develop a network of industrial contacts and play significant roles in a number of design organizations. His work as a designer included wide-ranging projects like household objects, furniture, motorcycles and many more. Among the most famous designs of Ekuan are the table bottle for soy sauce company Kikkoman designed in 1961, and the high-speed train “Akita Shinkansen”. Ekuan understood design as a source for improving the quality of life and emphasised that objects always need to have a certain spirit alongside functionality in order to be used with pleasure and not just as mere “tools”. Among his publications are The Philosophy of Tools (1980), The Buddhist Altar and the Automobile (1986), Soul and Material Things (1997), and The Aesthetics of the Japanese Lunchbox (1998), all espousing Ekuan’s unique philosophy of design. 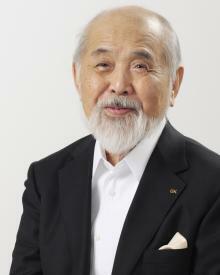 During his successful career, Ekuan served as chairman for the humanitarian organization “Design for the World“, as the President of the Japan Industrial Designers Association (1960) and in 1976 his international standing was confirmed by his election to the presidency of ICSID (the International Council of Societies of Industrial Design). In 1987, Kenji Ekuan he was awarded the prestigious biennial Osaka International Design Award, one of many such awards he received.